Google as we know it will no longer exist. 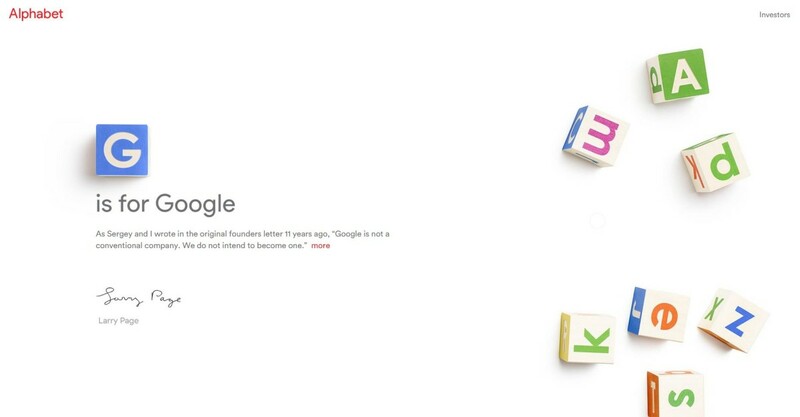 The company is reorganizing under a new umbrella structure called Alphabet, helmed by Google co-founders Larry Page as CEO and Sergey Brin as President. The new holding company will include all of Google’s current properties, with the largest of course being Google itself. Sundar Pichai will become CEO, getting a promotion from his previous role as Senior Vice President. Google proper will be slimmed down slightly to make way for the new corporation, mainly in areas that have to do in new advancements that are distinct from the company’s internet-based offerings. Page gives the example of products such as Life Sciences, which has worked on products such a glucose sensing contact lens, and Calico, which studies the factors affecting the lifespans of organisms. The X Lab – most known starting Google’s self-driving car project – will also now be a separate entity under Alphabet. The change should allow Google Alphabet to better manage and scale products in fields that aren’t directly related. Alphabet is also replacing Google as a publicly traded entity. All Google shares will be automatically be converted into the same number of shares from Alphabet, with Google becoming a wholly-owned subsidiary of the new company. Both of its types of shares will continue to trade as GOOG and GOOGL on Nasdaq. Meanwhile Google financials will be provided separately from the rest of the Alphabet business starting Q4 of this year. What does this mean in the long term? Theoretically, the collection of Mountain View team will be able to focus on more ambitious projects, while improving existing products like Google proper though a more focused portfolio. Page and Brin hope that each Alphabet company will be able to run independently and develop strong individual brand identity. YouTube, for instance, could in theory begin to shed some of its heavy Google association – dropping Google+ is a start – and become more of its own entity. Future acquisitions – looking at you, Twitter – could also continue to run largely on their own. As for why the need for the name change: Google is simply too heavily associated with search. The company has long been about more than that; Alphabet gives Page and Brin the freedom to enter new fields without customers (and investors) wondering “Why is a search company building a car?” New Alphabet ventures could take more risks without having as much of a negative impact on other facets of the company. It’s going to take a while to fully wrap our heads around Alphabet and what it means for the tech industry, but might as well start getting used to it.